Until the EPLF-led armed struggle ended with the creation of independent Eritrean state successive foreign powers ruled Eritrea for centuries. In the course of their colonization, the country was left with only skin and bone. Materially the country’s natural resources were extracted and taken away. The people were marginalized and put far from the horizon of development. Eritrea, like all African countries, was the creation of European colonization. The long European and Ethiopian colonial administrations in Eritrea disrupted the socio cultural and political structures of the Eritrean society. My point here is not to click past grudges to remember the pain caused by colonization but to indicate Eritrea’s struggle to strip herself from colonial rule and the values scored in the post-independence period. Eritrea entered a new phase of hope in 1991, leaving behind the agonizing experience of despair and uncertainty to history. The revolutionary legitimacy gained by the successful accomplishment of the struggle for liberation and the society’s burning desire to have a government of their own helped bring about a smooth transition. The triple values and norms that Eritrea was able to achieve, which I call the ‘three wheels’, are nation building, national unity and socio economic development. Eritrea was able to move forward by maintaining a balance among these factors. The government of Eritrea inherited a functionally and structurally devastated country, and, the people had high expectation and wanted a hasty change. The new government, helped by the structure and organization set out during the hard struggle, was able to manage the transition period without the occurrence of any kind of crises. The provisional government of Eritrea, formally installed by proclamation 23/1992, moved enthusiastically to replicate its revolutionary success in nation building. The revolutionary front quickly transformed itself a government to realize the hopes of the gallant people to build a prosperous and stable nation. The government was determined to build the nation along modern lines of state building such as the provision of social services, and the institutionalization and democratization of state machinery. In an attempt to set up institutions that governed the economic, political and social life of the country considerable progress has been made until the TPLF invasion of 1998, which endangered the survival of the nation. After the referendum that formally and popularly declared the sovereignty of Eritrea in 1993, the newly formed government established a constitution commission to draft the constitution and establish the national assembly. Proclamations were issued concerning the national assembly (1992), land (1994), national service, new regional administration (1996), establishment of community courts and election of judges(2003), local and regional elections, new civil and criminal laws (2015). All were as part of the determined effort of the government to build institutions and empower people. In social sphere, education and health programs were given high priority in the developmental transformation of Eritrea. Schools and clinics were spread in historically disadvantaged rural areas at high speed. Equitable distribution of social services was one of the six needs listed down in the national charter that guides the political program of the nation. The state’s educational and health policy spins around the belief that the main asset of Eritrea is its human resource. Education in Eritrea is a fundamental right and a lifelong process by which all individuals are given opportunities to attain their potential as all-round citizens2. The health sector was organized to promote and provide quality, preventive, curative and rehabilitative health care service through effective, efficient and affordable programs to all citizens3. Today schools and clinics are found in every corner of Eritrea. The performance of the nation was manifested in its ability to achieve many aspects of MDGs. Another important achievement made by the government was laying down infrastructure that was imperative to the social and economic development of the nation. Wide spread network of roads, telecommunication system, airport, large and medium strategic dams constructed largely by development workers of the national service program gave the nation fresh breath. African states are known for their failure to practice good governance, launch and implement social and economic programs, maintain good and fragile relations between government and the people, and provide security and stability for their citizens. Eritrea, unscathed by this common African syndrome, was able to accumulate enough capacity to initiate and implement programs of its own, to mobilize its people living inside and outside Eritrea, to provide peace and security for citizens by defending them from and external aggressions, to deliver social services and, above all to implant Eritrean national identity on every citizen. 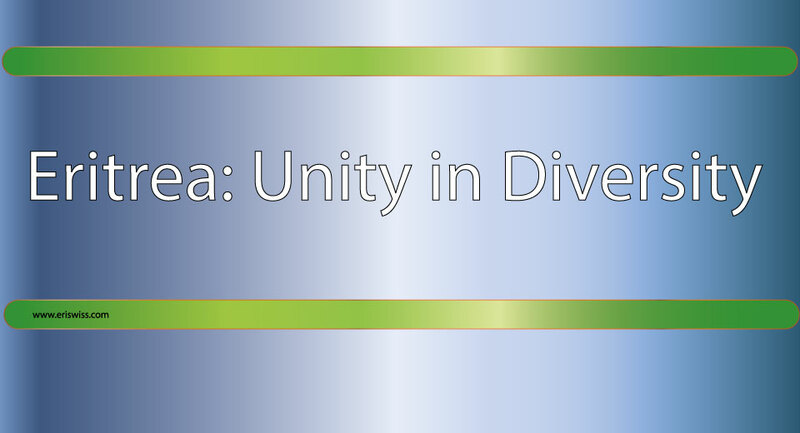 National unity in a diverse society is a primary need for nation building. Without unity, it’s virtually impossible to claim the existence of nationhood. Eritrea is home to nine ethnic groups and two major religions. The inexorable political core of the country the, PFDJ, continued its long standing motto “unity in diversity” to contribute its share in nation building. National unity has been one of the most highly cherished national values of Eritrea which the government is willing to guard at any cost. As part of this policy, the government set up the new regional administration (1996) that divides the country in to six administrative divisions. The rationale behind the redrawing of administrative boundaries was to combat sub-national sentiments and as give additional leverage to national unity. The peace and security enjoyed in the country is not primarily an outcome of a strong police force and security services but it was the result of the government’s investment in equitable distribution of resources. Since the policy of social justice has no room for alienation, discrimination and marginalization, no groups exist to grumble over these issues. The government of Eritrea follows a policy that looks at nation building, national unity and socio economic development as inseparable and indispensable factors for the development and continuity of the nation. Despite the multitude challenges faced, Eritrea, driven by wise and audacious policies has become an island of peace and security in the turbulent region. The long struggle has triggered fresh hopes and promise again. With its strong hard national unity and promising socio economic development, Eritrea is now poised to complete its task of nation building.